It can be said that German artist John Heartfield was the political artist whose work is the most visually effective exposing the ugly ideology and actions of fascist dictators. 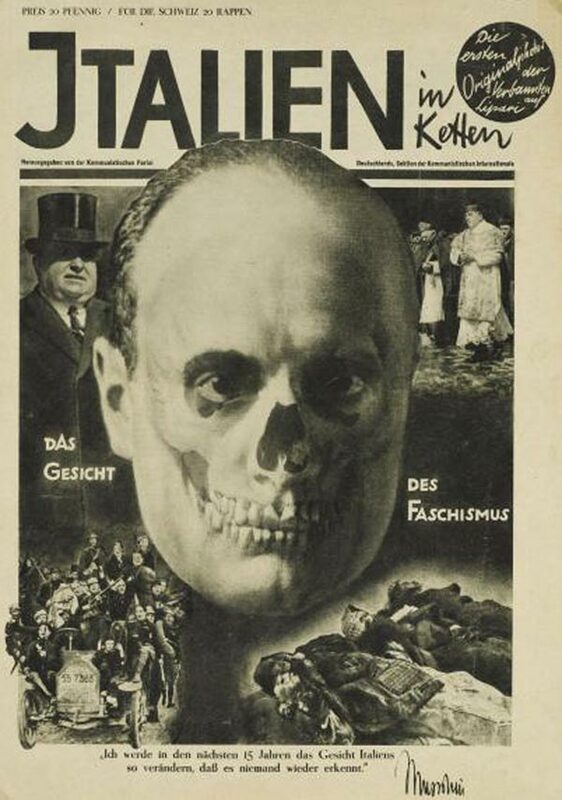 John Heartfield produced this masterpiece for the AIZ (Nr. 17) published April 4, 1936. The fascist monument of Benito Mussolini faces the inevitable wall that results in Fascist dictatorships. Mussolini, eager to control the Mediterranean, annexed Ethiopia on May 9, 1936. Mussolini's fascist assault used poison gas and air strikes against civilians. Hundreds of thousands were slaughtered. 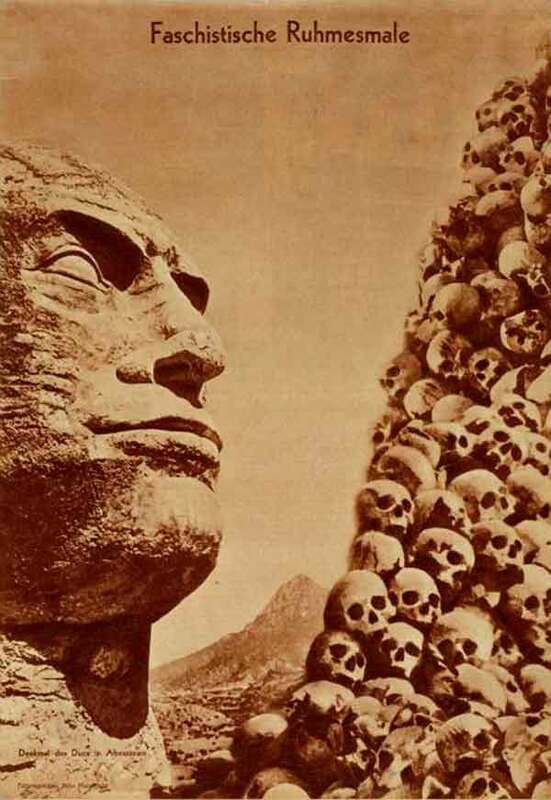 Heartfield responded to the atrocity in less than a month with a work of political art that remains completely relevant to our modern politics. Fascists promise prosperity and order. They bring division and death. This disturbing image of gassed civilians could serve as a poster for resistance to the fascist regimes of the 21st century. It is one of the most popular posters sold in The John Heartfield Exhibition Shop. It is a timeless reminder that unconditional love given to the "only one who can fix it" will always result in suffering and death. John Heartfield's 1928 portrait of Benito Mussolini The Face Of Fascism (Das Gesicht Des Faschismusbrilliantly plays off Mussolini's famous declaration, "I will change the face of Italy." He was correct. He was correct. He changed Italy's "face" to a death head of suffering. 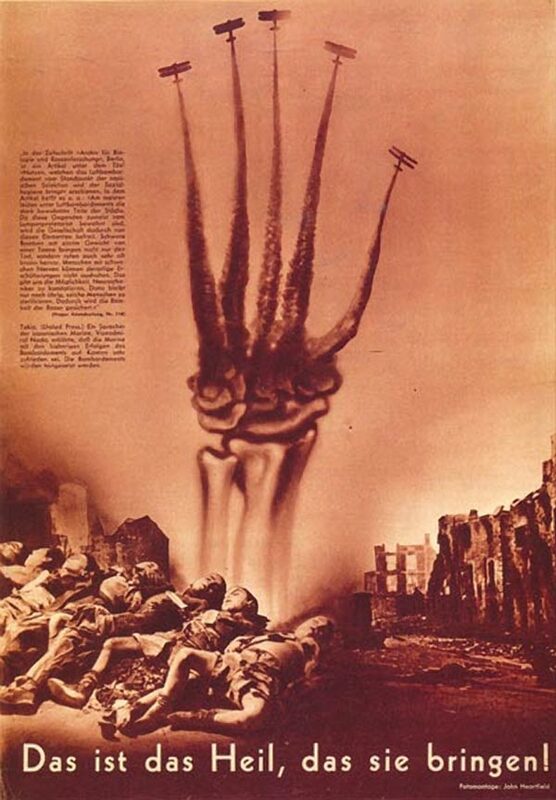 Heartfield brilliantly used the technique of double exposure to produce this chilling portrait of fascism. Mussolini, eager to control the Mediterranean, annexed Ethiopia on May 9, 1936. Mussolini's fascist assault used poison gas and air strikes against civilians. Hundreds of thousands were slaughtered. John Heartfield’s 240 famous political works of art for the AIZ magazine are the most illuminating blow-by-blow visual critique of fascism and Nazis according to the brilliant artist and Tate Modern Curator David King. My grandfather worked night after night, year after year, constantly risking his life, to combine his talent for collage with his understanding of the factors that directly lead to the horrors World War II. He was gifted with a heart capable of great compassion and a mind capable of using satire to strike at the very core of ugly fascist reality. His vision and his work are as essential today as when he used his art “as a weapon” against fascism and the Nazis.